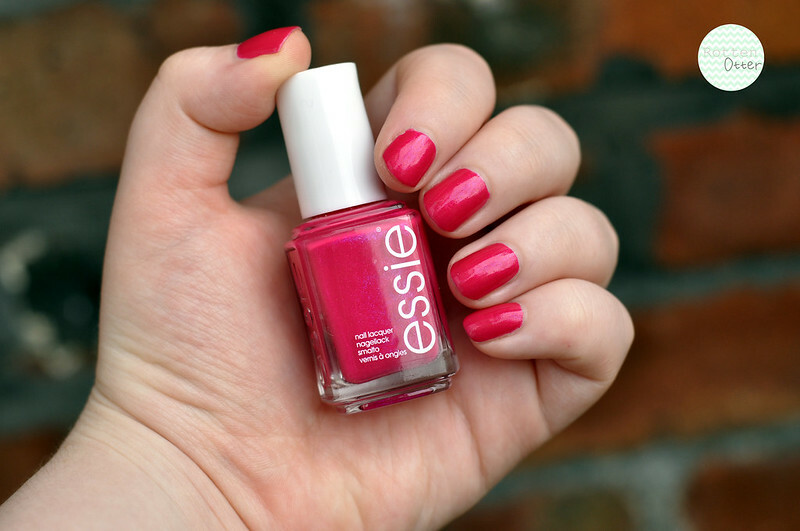 I thought I'd found the best nail polish formula which was China Glaze Strawberry Fields but this one from Essie is even better. It almost has a gel like formula and just glides onto the nail. I didn't even need to clean up after applying it. You can almost get away with one coat but I always like to apply two as I find it lasts better. The only downside is that it does dry to a slightly matte finish so I apply a top coat. Also without a good base coat, this will stain your nails pink. Super Bosa Nova is a bright hot pink with a hint of raspberry. It's also packed with magenta/blue shimmer which isn't that obvious on the nail, only when in direct sunlight. In other lights it just sort of adds a blue hint to the pink. The best thing about it was the price, I bought it from Fragrance Direct for only £1.99 but it doesn't seem to be available anymore. Keep an eye out though as they might bring it back. I really like this shade. I tend to avoid really bright pinks but I love the shimmer through it! This colour is so nice and unique ! Love the colour it so pretty! I do like a pretty pink & it has a hint of shimmer so that makes it a 10 / 10 for me. What a lovely colour.